Though the calendar says September, the weather is still perfect for some outdoor adventure. One activity that is always a hit with my family is stream exploration! It is cheap (actually free, unless you do a guided trip), educational (but don’t tell the kids! ), and doesn’t need many supplies or much planning. As for timing, you can do a lot of exploring in just half an hour, or you can while away an entire afternoon. Basically, you just need to find a creek—then start exploring it! 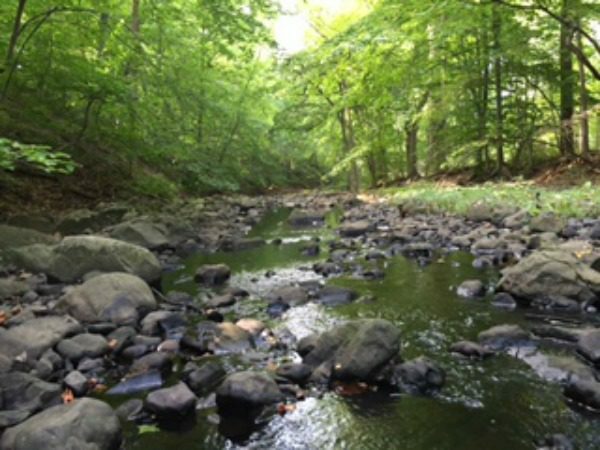 We have done a couple of environmentalist-led explorations in the summer at the Whippany River, a small stream with access along a short trail off Rt. 24/Mendham Road across from Sunrise Lake in Lewis Morris Park in Morristown. The explorations were led by Janis from the Great Swamp Outdoor Education Center. She brings buckets, nets, and invertebrate identification charts, and has an infinite amount of knowledge about stream life. We’ve also explored a creek with a group at a family camp we went to this summer in the Catskills. However, one of our favorite stream explorations was just an impromptu stop along a burbling brook in Loantaka Brook Reservation during a leisurely family bike ride two weeks ago. We stopped for a water break, then spent the next hour with our shoes off, paddling around the water. Water shoes You can go bare foot, but wet rocks covered in algae can get VERY slippery. I suggest water shoes with good traction (not Crocs), or old sneakers. Clothes that can get wet More than likely, you will get wet, and, even better, dirty! Fishing net You’ll probably find some areas that are too deep to reach, or, hopefully, some creatures (i.e. crayfish) that you might not want to pick up with your bare hands. Nets are great for catching frogs, too! Buckets or small plastic bins To examine the creatures you find more closely, without harming them, keep them in water in a container for a while, but be sure to return them to their home when you are done. Magnifying glass To help you get an even closer look at what you catch! Trash bag You are bound to come across some trash while you explore. May as well do some good and pick it up! Stream creature identification guide There are many different guides online, but here is one that can help you identify the creatures and determine the level of pollution in the creek. Build balanced rock towers, also known as cairns. Some people feel that cairns disrupt the beauty of nature and animal homes, though, so it is best to take them down before you leave. Make rock paints. The stream we explored in the Catskills had a huge variety of stones, many of which could be rubbed together to make “paint.” My son found ones that created amazing hues of red, brown, yellow, and green, then used them to paint his face and other rocks. So, next time your kids ask to watch some live streams, grab your fishing nets and buckets, take them outside, and start exploring!